NEW ORLEANS – Over the years, Palo Alto, California, has played host to some incredible efforts when it comes to collegiate distance running. From the Stanford Invitational to the Payton Jordan Invitational, loaded heats mean quick times and possible records for those collegians involved. In fact, all 10 of the top-10 times run by women over 10000 meters in collegiate history have come in Palo Alto, as have 8 of the top-10 men’s marks in that event. When it comes to the 5000, 4 of the top-10 men’s marks have been run as have 5 of the top-10 women’s marks. 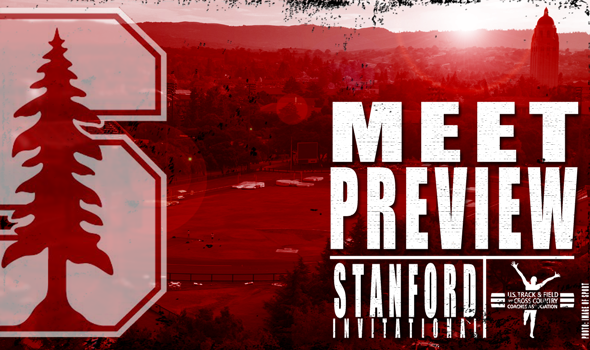 This weekend is the 42nd installment of the Stanford Invitational, which was first held in 1975. All of the major distance events and heats will once again be held on Friday night. Loads of All-Americans from cross country and indoor track & field will be in action and that’s not just from the NCAA Division I level. Several from the NCAA Division II and NCAA Division III level will test their might this weekend. We previewed the Texas Relays yesterday, so it’s time to check out what the Stanford Invitational has in store for collegiate track & field fans in 2017. Five of the 19 men who competed in the mile finals at the NCAA Division I and NCAA Division II Indoor Track & Field Championships are entered into this field. From NCAA Division I we have Oklahoma State’s Joshua Thompson (6th) and Oregon’s Matthew Maton (9th). And from the NCAA Division II level, the Western Oregon duo of David Ribich (3rd) and Dustin Nadig (4th) will be joined by Hillsdale’s Caleb Gatchell (6th). Six more standouts from the NCAA DI level will be in the mix as well: Oregon’s Tim Gorman, Blake Haney (11th place in NCAA 1500 last year) and Sam Prakel (5th place), Oklahoma State’s Craig Nowak, Providence’s Julian Oakley and Boise State’s Yusuke Uchikoshi. While the star power isn’t as evident in the women’s 1500 with just two mile finalists from the most recent NCAA Division I and NCAA Division II Indoor Track & Field Championships in action (Simon Fraser’s Paige Nock and Providence’s Millie Paladino), there are still a good amount of talented runners to look out for. Several of them are Oregon’s Lilli Burdon (member of the Ducks’ indoor DMR team that set a collegiate record), Oklahoma State’s Savannah Camacho, BYU’s Shea Collinsworth (3rd place in the 800 at NCAAs earlier this month) and Penn’s Ashley Montgomery. Five All-Americans from the cross country season will be in the mix, as will three finalists from the 3000-meter final at the most recent NCAA Division I Indoor Track & Field Championships. Those athletes who competed in College Station, Texas, earlier this month are Colorado State’s Cole Rockhold (6th), California’s Garrett Corcoran (14th) and Oregon’s Matthew Maton (16th). Maton is included in the count of XC All-Americans since he finished 29th back in November. Joining Maton in that XC All-American regard is Arkansas’ Alex George and Jack Bruce, Boise State’s Yusuke Uchikoshi, Wisconsin’s Malachy Schrobilgen and Indiana’s Jason Crist. The story here is Karissa Schweizer making her outdoor debut. Schweizer captured the NCAA XC individual title back in November and added the 5000 crown to her cupboard in March. She also finished runner-up in the 3000, so we could have been looking at a clean sweep of individual distance titles at NCAAs. Not to be outdone, Grand Valley State’s Kendra Foley is in the field. Foley won the 2016 NCAA DII XC title in Saint Leo, Florida, and recently earned two All-America honors indoors. Other standouts entered in the meet are (in alphabetical order by last name): Cal Poly’s Peyton Bilo, Iowa State’s Bethanie Brown, Wisconsin’s Sarah Disanza, Penn State’s Tori Gerlach, Arizona’s Claire Green, Penn State’s Jillian Hunsberger, Providence’s Brianna Ilarda, Washington’s Katie Knight, Hillsdale’s Hannah McIntyre, Baylor’s Maggie Montoya, Washington’s Amy-Eloise Neale, Boise State’s Brenna Peloquin, Vanderbilt’s Caroline Pietrzyk and Indiana’s Katherine Reeveur, among others. Oregon’s Edward Cheserek is scheduled to make his outdoor debut. Cheserek is coming off an indoor season that saw him add two more NCAA titles to his haul (3000/5000) and break a collegiate record in the mile. Based on heat sheets, Cheserek could match up with any number of the following men, which would make for a great race: Oklahoma State’s Hassan Abdi and Sylvester Barus, Northern Arizona’s Matthew Baxter, Tyler Day and Cory Glines, Syracuse’s Colin Bennie and Philo Germano, Alabama’s Alfred Chelanga, Colorado State’s Grant Fischer and Jerrell Mock, Ole Miss’ Wes Gallagher, NC State’s George Parsons, Butler’s Erik Peterson, South Dakota’s Joel Reichow, Arkansas’ Andrew Ronoh, San Francisco’s Alex Short and Wisconsin’s Malachy Schrobilgen (also entered in the 5000). The heavy hitters here include Kansas’ Sharon Lokedi, Stevens Institute’s Amy Regan and Notre Dame’s Anna Rohrer. Lokedi and Regan are primed to make their track debuts for 2017 and could be in store for incredible seasons after where they left off during cross country. Lokedi placed 5th overall at the 2016 NCAA Division I Cross Country Championships, while Regan rolled to the individual title at the NCAA DIII meet and added to her already decorated career. Rohrer is coming off an indoor season that saw her finish 3rd in the 5000 behind Missouri’s Karissa Schweizer and Michigan’s Erin Finn. It was back in November when she finished 3rd behind the same women during the NCAA DI XC meet. This is the first 10000-meter race of Rohrer’s collegiate career. Several other athletes to look out for include NC State’s Erika Kemp, Eastern Michigan’s Jordan McDermitt and San Francisco’s Charlotte Taylor. Boise State’s Allie Ostrander, who redshirted during the cross country season and didn’t compete indoors, is scheduled to race in the 3000 steeplechase. Ostrander last competed at the 2016 U.S. Olympic Track & Field Trials.